We’d love your help. Let us know what’s wrong with this preview of The Bedford Glossary of Critical and Literary Terms by Ross C. Murfin. Like its highly praised and widely adopted predecessor, the second edition of The Bedford Glossary presents definitions of more than 700 literary and critical terms for today's student. The second edition features many additional terms, both traditional and recent, with a greater array of examples that make it an even more useful and informative reference than before. 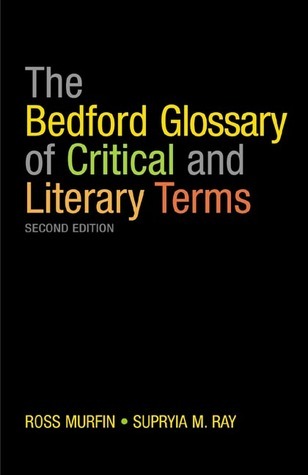 To ask other readers questions about The Bedford Glossary of Critical and Literary Terms, please sign up. If you're going to do any theory courses, get this book. It saves a lot of time, cuts through the headache created by these theorist assholes, and explains everything in terms that can be understood by anyone with a GED. Definitely useful, though it won't make theory any less painful. This is a very valuable resource book if you are looking for even a slightly deeper understanding of literary terms. There are numerous entries with thorough explanations, and the language is very accessible. While I can't remember what they were right off hand, I believe there were only a couple of terms I encountered that were not in the book. A high recommendation for your resource shelf. This is such a helpful book for any English scholar. The examples are great and the alphabetization makes it easy to search for exactly what you need. Hopefully this will help me pass the Praxis II this weekend! An excellent resource for any scholar of literature. The easy alphabetical organization allows you to find various terms with ease. Incredibly useful and informative - whenever I need to brush up on a literary term or learn a new one, this is the book I turn to every time. This book has every term I've ever needed to look up. I take it with me to Graduate school every summer. It really socks my socks. Brilliant - quickly became indispensable for me. Wish there was a bit more comprehensive coverage of the world of tropes, but that's a minor quibble. So helpful. I've cited this is almost all of my essays this semester. Very detailed. Frequently publishes as 'Ross Murfin' (no middle initial).